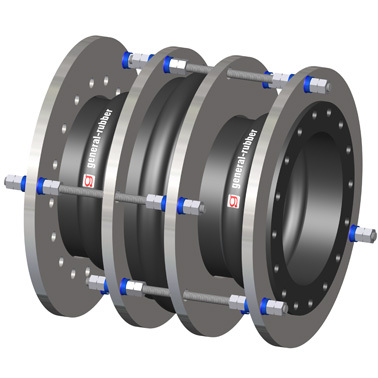 General Rubber's Style 5100P in-line pressure balanced rubber expansion joints are the only effective solution for directly absorbing large axial thermal movements while continuously self-restraining the pressure thrust forces. This arrangement consists of tie devices inter-connecting its main joint sections to its opposing balancing joint section and is commonly used when the support structure or adjacent equipment have load limitations. The body is a one-piece rubber construction with full rubber flanges, a high-grade leak-proof tube, multiple layers of high-strength tire cord, high tensile steel reinforcement, a seamless cover and hot dip galvanized steel retaining rings. Additionally, they are designed to absorb all-directional movement, reduce noise and vibration, have a cycle life in the tens of millions, compensate for misalignments, provide access to piping and equipment and relieve pipe and anchor stresses. The economic benefits of using pressure balanced designs include a smaller system footprint as well as far fewer guides, anchors and supports.